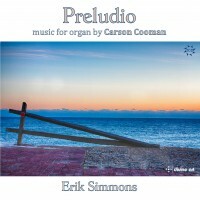 Canzona III (2013) is dedicated to Susie Jarrell, the prime mover behind the yearly Nantucket Organ Crawl, and an important presence for many years in the island’s musical life as organist, pianist, teacher, and concert organizer. The music is based primarily upon a mixed mode that is a cross between the Lydian and Mixolydian modes (C-D-E-F#-G-A-Bb). In the manner of instrumental canzoni of the late 16th century, the work is in several sections, with thematic connections. The opening section pursues a two-voice contrapuntal treatment of a typical canzona rhythm, though with an added syncopation. The second section is quiet and very slow, in the manner of Girolamo Frescobaldi’s elevation toccatas: filled with long suspensions and resolutions. The final section is a joyful rondeau, which moves from a pure C major to the mixed mode again.